The holidays are fast approaching and it’s time to get your home in top shape for family and guests. Save yourself time and energy with professional residential cleaning and advanced planning for meals and overnight guests. Here are a few simple steps to get your home ready so you can relax and enjoy the holidays. Are you hosting friends and family this year? Decorate for the season with fresh flowers, table décor, lights, candles, mantle décor, and more. Nothing feels more like the holidays than seasonal decorations to make a home cozy and inviting. Plan your holiday meals now and prepare your grocery shopping list in advance. If family or guests are contributing to main dishes, desserts, or drinks, include this in your planning so you can offer suggestions on what they can bring. Pick up non-perishable items weeks in advance and know when you need to purchase perishable items before your dinner or event. We all say we won’t wait until the last minute for holiday shopping, but the season gets so busy! Make a point to think about gifts early and sneak in a trip to the store or shop online during a lunch break, after work, or on the weekends. The more shopping you can knock out early, the less stress you’ll have during the week (or day) before Christmas. Now is the perfect time to declutter your counters and clean out your pantry and fridge. You’ll be cooking up a storm and you’ll need room in your fridge for fresh food and space on your counters to prepare your gourmet meals. Are guests coming from out of town? Plan ahead now and have spare bedrooms ready with clean sheets or air mattresses available with floor space. Make sure you have enough towels and amenities to make your guests feel right at home. You have enough details to think about. 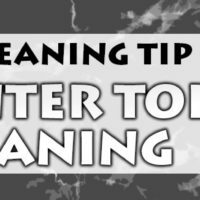 Don’t let worrying about deep cleaning your home be one of them. Focus on the cooking and entertaining and hire a professional residential cleaning service to do the dirty work for you. Your kitchen will be sparkling and your home will be germ-free and ready for guests. Consider having your home cleaned after guests leave for a fresh start to the new year. Is your home ready for the holidays? Maid to Shine offers professional residential cleaning so you can relax and focus on preparing for the holidays. Give us a call to schedule house cleaning services today.